The perfect place to spend unforgettable holidays with your family! The villa is very quiet and sunny with relaxing views of the forest. It consists of 4 bedrooms on the ground floor and a fifth in mezzanine, including 2 bedrooms each with 2 single beds and two bedrooms each with a large double bed and private shower. Branded piano for amateurs or professionals. Beaches and shops (caterer, grocery, bread, ...) are a 5 minute walk. There are also two very nice restaurants (Etche Ona and La Suite) at a distance of 400 meters, and a few further afield two magnificent "upscale" restaurants by Philip Stark - Co (o) rniche and Ha (a) ïtza - and a very popular beach restaurant below the Co (o) rniche - the Blockhaus - for teenagers and more, where you can have a drink but also meals in the evening and lunch in a very nice atmosphere .. . If you have any questions, do not hesitate to contact me by phone or email. On this mythical place, were built in 1890 the famous 'Cabanes Tchanquées'. ('tchanqué' comes from Gascon 'chancas' meaning stilts) These 2 huts on stilts were originally occupied by oyster park keepers. Known worldwide, they remain the emblem of the Arcachon Basin. One of them was rebuilt in 2008 in the identical, do not forget to compare it with your old shots. Caution: the island is surrounded by oyster beds. DUNE DU PILAT ...: Ranked among the major national sites, this sand dune is the highest in Europe with 104 meters of altitude, 2700 m long and 500 m wide. Its height was 29 m in 1855 and 113 m in 1936. Consisting of 60 million m3 of sand, you will have no difficulty in deducing the number of grains ... which compose it! Its climb completed, we discover an exceptional 360 ° panorama: the Banc d'Arguin, the entrance to the Bassin d'Arcachon, the Pointe du Cap Ferret, the immensity of the Atlantic Ocean and the first pines of the Forest Landaise, the largest forest in Europe spanning one million hectares. BANC D'ARGUIN ...: Located at the entrance to the Bassin d'Arcachon, facing the Dune du Pilat, the Banc d'Arguin is a National Nature Reserve of about 2200 hectares (land and sea). Many bird species frequent it for nesting (more than 4000) as for migration or overwintering (more than 30 000). The bench of Arguin is a tourist place in summer season. We also note the significant presence of oyster farming on this territory. The Dog Bank no longer exists, and the Toulinguet disappears at high tide (where only the haired beasts are allowed). Do not look for a bridge, access is only by the sea. Two bathrooms with shower, sink and toilet - Independent showers in doubles RC - Independent WC and washbasin at the entrance. Daniel was great; right there to meet me when I arrived. The apartment is utterly clean, cute, comfortable. Everything you need. And perfectly located, on a quiet walk - no cars - street, just off Place de la Contrescarpe. Maison très agréable car spacieuse et lumineuse. Lampes chauffantes pour la terrasse extérieure très appréciées lors de notre séjour en mai. Propriétaire très agréable , disponible et de très bon conseil . Par contre en hors saison les bateaux pour le Cap ferret ne partent que d'arcachon et beaucoup de difficulté pour stationner la voiture. La proximité de la dune est appréciable , a faire plutôt en début de soirée pour éviter la foule. Bref très bon séjour malgré la pluie ! Maison spacieuse, agréable et moderne, en tout point conforme à l'annonce. Tout est très propre et le propriétaire est très disponible pour tout type de questions. Le plus de la terrasse: il y a des chauffages halogènes type "terrasse de cafe" pour les soirées de printemps un peu fraiches. La plage est à 5 min a pied et le quartier est calme et agréable. Bref, nous reviendrons surement si nous en avons l'occasion! Excellent séjour dans un cadre optimal. 10 personnes sur 4 générations réunies pour Pâques sans que le dernier bébé ne dérange l'arrière grand-mère. La maison est moderne, spacieuse et trés bien équipée tant à l'intérieur qu'à l'extérieur (nous avons alterné pluie et soleil). Grand espace pour les véhicules et calme assuré à 5 minutes à pied du bassin. A noter l'accueil chaleureux et efficace. Merci pour vos commentaires utiles et sympathiques. La supérette (Epicerie de la Baronne) située 244, bd de l'Océan, à 3 mn à pied de la villa, est bien ouverte de 8h à 14h et de 16h à 20h tous les jours de la semaine (sauf le jeudi) et ceci tout au long de l'année, sauf de janvier à mars. 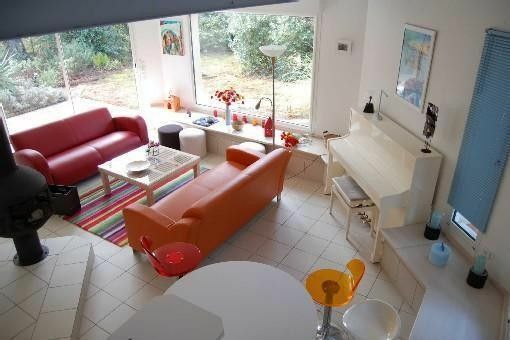 Between 300 meters from the beach of the Canaries and shops (5 minutes walk) in the popular area of ​​the Forest Chapel, at 3500 meters Arcachon town, 1500 meters from the Dune du Pilat. Direct access to hiking trails. Located along the Bay of Arcachon, near the highest dune in Europe, the International Golf Arcachon enjoys an exceptional situation. The course, lined with typical species of the region (pine trees, mimosas, oak and arbutus) is both hilly in the first 9 holes and flatter in the last 9 which include several water hazards. Throughout its 18 holes (5,760 yards, par 72), the players, whether beginners or experienced, will take full advantage of this preserved natural environment conducive to the success of their scores. Sand, pine, water: serenity near the Arcachon basin and the Bordeaux region. A fun course internationally renowned combining technical difficulty and aesthetic layout. Like the famous Florida course, the golf Gujan best fits the natural beauty that surrounds: pine forest, lakes and white sand bunkers are the elements of a grandiose setting that inspires achievement.